Lending-based crowdfunding platforms represent a new mode of financial intermediation by connecting lenders and borrowers directly using internet platforms. While their share of the loan market is still very small, in some niches these platforms are a real alternative to bank credit. 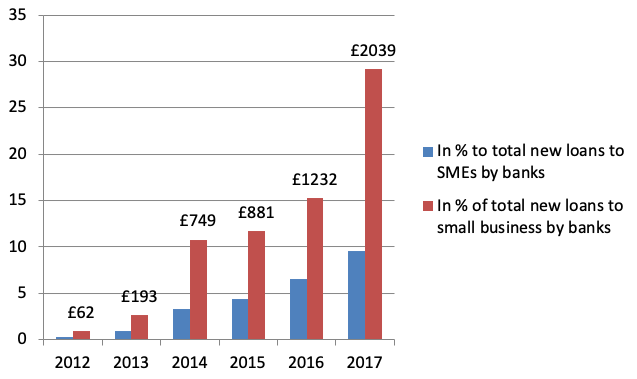 For example, in 2017, business lending by UK crowdfunding platforms amounted to almost 30% of new loans to small businesses (Zhang et al. 2018) (see Figure 1). Source: Zhang et al. (2018). Technically, lending-based crowdfunding platforms do not perform risk and maturity transformation, but they are experimenting with business models that could allow them to perform bank-like functions in the future (Havrylchyk and Verdier 2018). Many platforms allow lenders to automate their lending process by setting lending criteria (risk, maturity, and so on). This lowers transaction costs and permits diversification. Platforms use credit scoring to assign a risk band to every borrower and effectively play the role of a delegated monitor insofar as lenders delegate to them due-diligence. Some platforms provide liquidity services by creating secondary markets in which lenders sell their loans to other investors. To review existing regulatory practices, we sent a questionnaire about regulation of crowdfunding to all OECD countries, and received 17 replies (Havrylchyk 2018). While many OECD countries require lending-based crowdfunding platforms to adapt to existing regulation, nine of the responding countries had put in place legislation designed to regulate this mode of financial intermediation. In March 2018, following consultations, the European Commission presented a proposal for an EU-wide passporting regime for both lending-based and investment-based crowdfunding (European Commission 2018). Notes: Yes/No – if activity is allowed/not allowed; NR – if activity is not regulated or not mentioned in the law. Information is provided separately for two legal statuses of lending-based platforms that facilitate loan agreements and investment-based platforms that facilitate debt securities. Source: OECD Questionnaire in Havrylchyk (2018). Table 1 summarises the results of the questionnaire for countries that have put in place specifically designed regulation for lending-based crowdfunding. These regulatory texts do not propose any instruments, but rather define the scope of activities of crowdfunding platforms. While some regulators restrict crowdfunding platforms to simple credit intermediation, others explicitly set high maximum amounts for originated loans, allow automated lending, provision funds, and secondary markets, and permit a platform to invest in loans that it facilitates. Restricting crowdfunding platforms to credit intermediation limits short-term risks, but it also prevents platforms from experimenting with business models, and eventually competing with banks. In this context, the recent European Commission regulatory proposal appears to be conservative, since it does not mention automated lending, limits the maximum loan amount to €1 million, explicitly forbids platform from investing in loans, and limits the responsibility of platforms in the organisation of secondary markets (called 'bulletin boards'). There are three types of market failures in the financial system that need to be addressed by the regulators: coordination problems and runs, moral hazard and adverse selection, and market power or barriers to entry. Large lending-based crowdfunding platforms offer secondary markets, which are a useful feature for providing liquidity to investors and could be essential if platforms are to scale up. Theoretically, platforms with secondary markets would not be subject to coordination problems and self-fulfilling runs in the same way as banks are. The direct link between lenders and borrowers ensures that lenders’ strategy (to run or not to run) does not depend on the strategy of other lenders, but only on the solvency of borrowers in their loan portfolio. Nevertheless, secondary markets might become illiquid and misprice traded loans. Also, it would be misleading for platforms to promise lenders maturity transformation (that is, their investment can be always liquidated). Currently, secondary markets are forbidden in many countries – and in some cases the regulatory approach is not clear, as Table 1 shows. In particular, the EU proposal explicitly states that platforms cannot put in place a trading system but, instead, proposes a bulletin board that allows investors to interact directly with each other to buy and sell loan agreements or transferable securities. Importantly, this buying and selling activity on crowdfunding platforms is at the client's own discretion and responsibility. How do we ensure well-functioning secondary markets? How can we ensure that platforms do not promise the transformation of maturity to lenders? Retail lenders face severe adverse selection problems when choosing to whom they lend. This problem is particularly acute because most regulators set a maximum loan size (Table 1). This allows lending only to small businesses, and this type of lending tends to be riskier and opaque. To mitigate this adverse selection, lenders delegate due diligence to crowdfunding platforms. Hence, it is important to ensure that platforms have good risk management systems. Platforms are likely to experiment with new methods of credit scoring that rely on big data and machine learning. While these techniques are promising, they are untested. Importantly, due diligence and scoring models are currently not supervised. Since lenders bear all credit losses, aligning incentives between platforms and lenders should be at the heart of regulation. To signal that they retain some risk, several platforms invest in loans that they facilitate, while others use their own capital to create provision funds that absorb first losses. Indeed, if platforms do not retain the risk of the loans they facilitate, their business model could resemble the 'originate and distribute' model of the securitisation process. This was one of the major causes of the global crisis, as it loosened credit standards. In the EU proposal, platforms are explicitly forbidden to invest in loans that they facilitate in several countries (Table 1). This rule is motivated by the potential conflict of interest, because platforms might cherry-pick the best loans. this is a legitimate concern. If platforms invest in any loans, they should invest in allloans. A well-designed minimum capital requirement could be used as a tool to provide incentives to platforms managers and shareholders not to expose lenders to excessive risks. Finally, if platforms become systemically important in the future, it is important to ensure that an orderly resolution is possible – in other words, the continuation of loan repayments so that lenders do not lose money if the platform fails. This is important because if there are financial institutions that are too big or too interconnected to fail, this increases the likelihood of state bail-outs. This intensifies moral hazard problems. No large platform has yet failed, but the direct connection between lenders and borrowers means it would be easier to design an orderly resolution for a platform than for a bank. Since all lenders bear their own losses, it is comparable to a bail-in mechanism. How can we ensure that platforms have good risk management systems in place, without constraining innovation in scoring models? How do we regulate the alignment of incentives between platforms and lenders? How can we ensure a smooth resolution in case of failure? Lending-based crowdfunding platforms are entering a market dominated by large banks and face many barriers to entry. Due to high switching costs, platforms are forced to pursue a market-expansion strategy toward risky borrowers who are underserved by incumbent banks (De Roure et al. 2016, Morse 2015). This worked during the post-crisis period, when banks needed to deleverage and cut their loan supply to creditworthy borrowers (Havrylchyk et al. 2018). But if entrants serve only borrowers who have been rejected by banks, they risk higher default rates and lose servicing fees. This means that the long-term viability of the crowdfunding business model is likely to require that banks and platforms directly compete for good borrowers. This is complicated: incumbent banks have an informational advantage over lending-based crowdfunding platforms. Long-term relationships give banks granular data on their borrowers, that allow them to model the default risk. The scale and scope economies inherent in financial intermediation are also a significant barrier to entry. Finally, explicit and implicit government guarantees imply a funding-cost advantage. They allow large banks to provide credit at a lower interest rate than crowdfunding platforms, all other things being equal. How should we level the playing field between platforms and banks? Should policymakers make it easier to switch to new technologies, and with what instruments? How can we ensure that policies towards incumbent banks (such as explicit and implicit guarantees that result in lower funding costs) do not distort the level playing field between banks and crowdfunding platforms? The above discussion suggests that the crowdfunding business model could potentially be more stable than banking, because it is less leveraged, less prone to runs and easier to resolve. On the other hand, most platforms allow sophisticated institutional lenders to invest because this provides an important guarantee to borrowers that their loans will be funded. But if these institutional lenders are leveraged and prone to runs and moral hazard problems, all the advantages of the lending-based crowdfunding business model could be lost. How can we ensure fair treatment of both retail and institutional investors? How can we limit the interconnectedness of lending-based crowdfunding platforms and leveraged, too-big-to-fail institutions? To sum up, lending-based crowdfunding platforms are experimenting with different business models. Therefore it is important to ensure that this experimentation happens under the eye of strong regulators and supervisors, who are able to intervene to address the potential market failures. De Roure, C, L Pelizzon, P Tasca (2016), "How does P2P lending fit into the consumer credit market? ", Deutsche Bundesbank discussion paper 30/2016. European Commission (2018), "Proposal for a regulation of the European parliament and of the council on European crowdfunding service providers for business". Havrylchyk, O and M Verdier (2018), "The financial intermediation role of the P2P lending platforms", Comparative Economic Systems 60(1): 115-130. Havrylchyk, O, C Mariotto, T Rahim and M Verdier (2018), "What drives the expansion of the peer-to-peer lending? ", working paper. Havrylchyk, O (2018), "Regulatory framework for the loan-based crowdfunding platforms", OECD working paper 1513. Morse, A (2015), "Peer-to-Peer Crowdfunding: Information and the Potential of disruption in consumer lending", NBER working paper 20899. Zhang, B, T Ziegler, L Mammadove, D Johanson, M Gray and N Yerolemou (2018), 5th UK Alternative Finance Industry Report, Cambridge Centre for Alternative Finance.